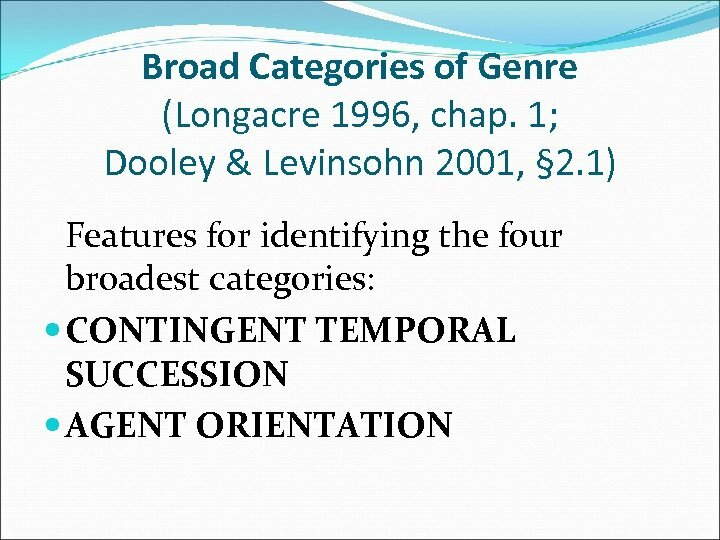 Broad Categories of Genre (4) CONTINGENT TEMPORAL SUCCESSION refers to a framework “in which some (often most) of the events or doings are contingent on previous events or doings”. 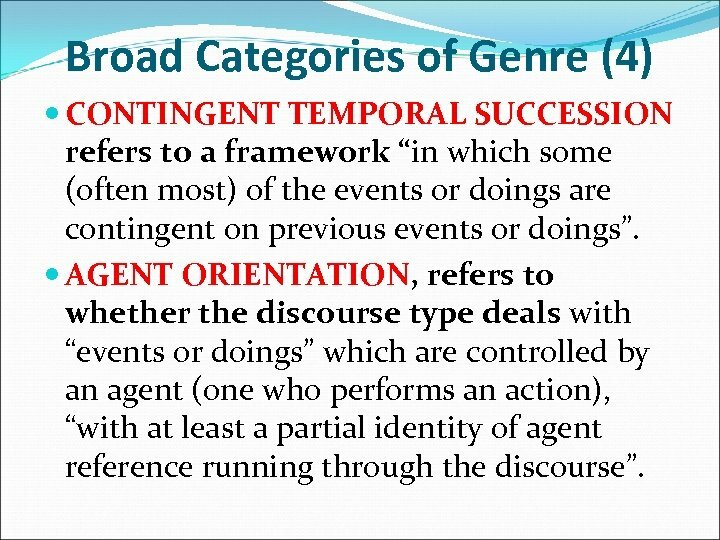 AGENT ORIENTATION, refers to whether the discourse type deals with “events or doings” which are controlled by an agent (one who performs an action), “with at least a partial identity of agent reference running through the discourse”. 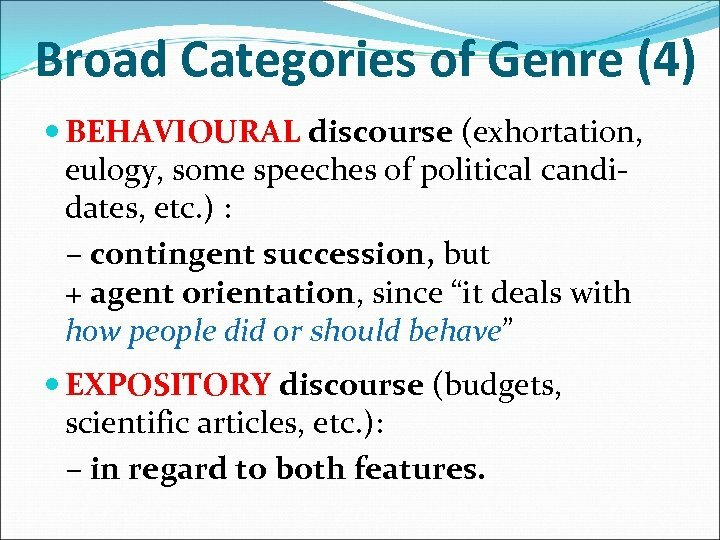 Broad Categories of Genre (4) BEHAVIOURAL discourse (exhortation, eulogy, some speeches of political candidates, etc. ) 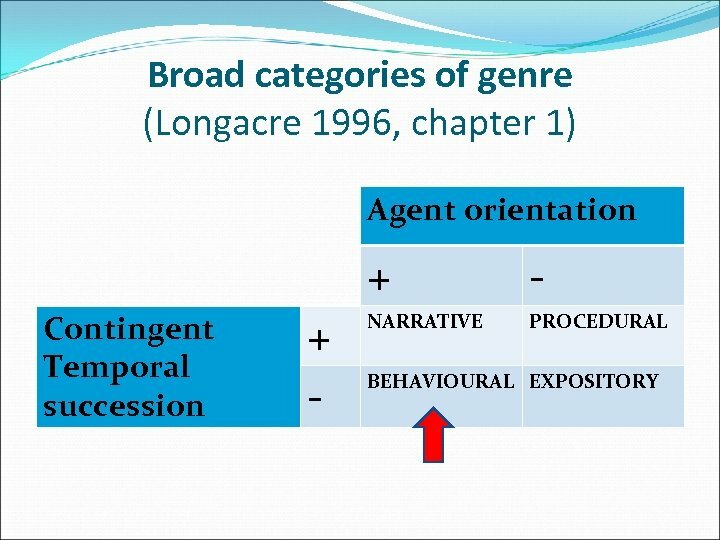 : – contingent succession, but + agent orientation, since “it deals with how people did or should behave” EXPOSITORY discourse (budgets, scientific articles, etc. ): – in regard to both features. 2. 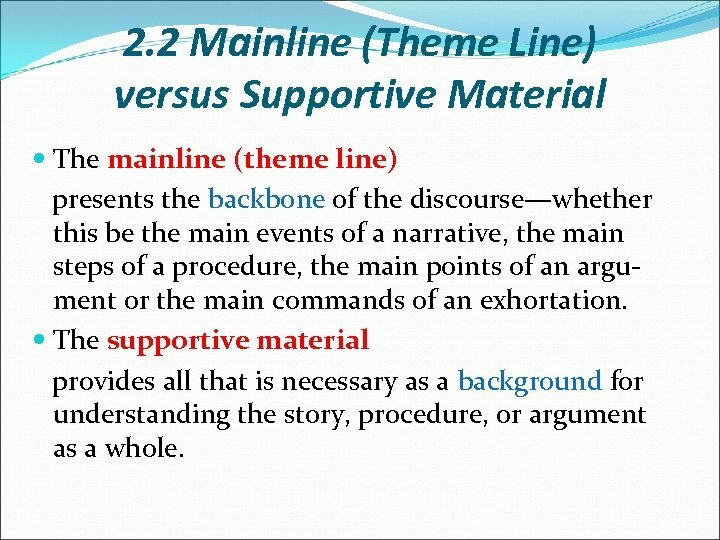 2 Mainline (Theme Line) versus Supportive Material The mainline (theme line) presents the backbone of the discourse—whether this be the main events of a narrative, the main steps of a procedure, the main points of an argument or the main commands of an exhortation. 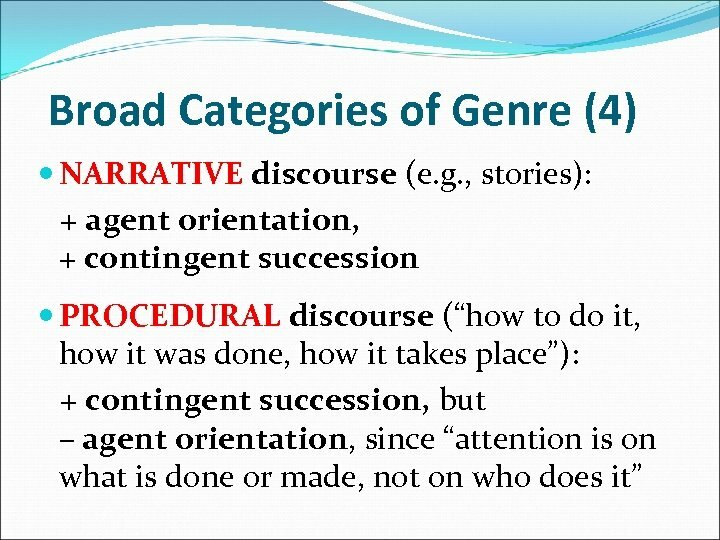 The supportive material provides all that is necessary as a background for understanding the story, procedure, or argument as a whole. 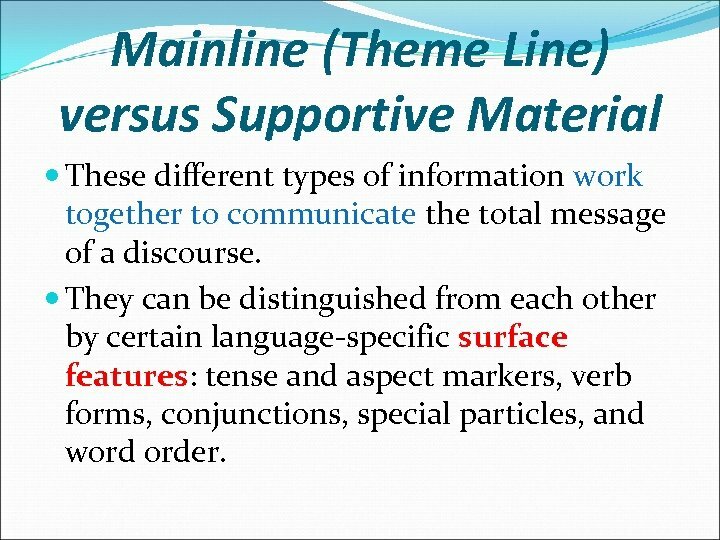 Mainline (Theme Line) versus Supportive Material These different types of information work together to communicate the total message of a discourse. They can be distinguished from each other by certain language-specific surface features: tense and aspect markers, verb forms, conjunctions, special particles, and word order. 2. 2. 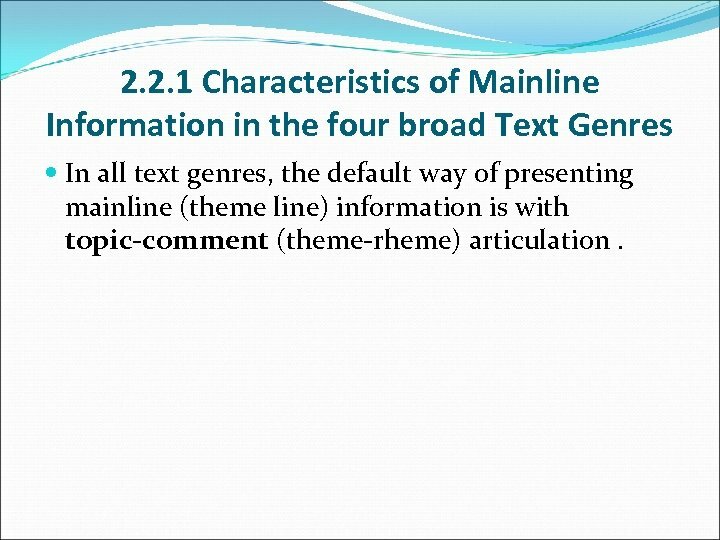 1 Characteristics of Mainline Information in the four broad Text Genres In all text genres, the default way of presenting mainline (theme line) information is with topic-comment (theme-rheme) articulation. 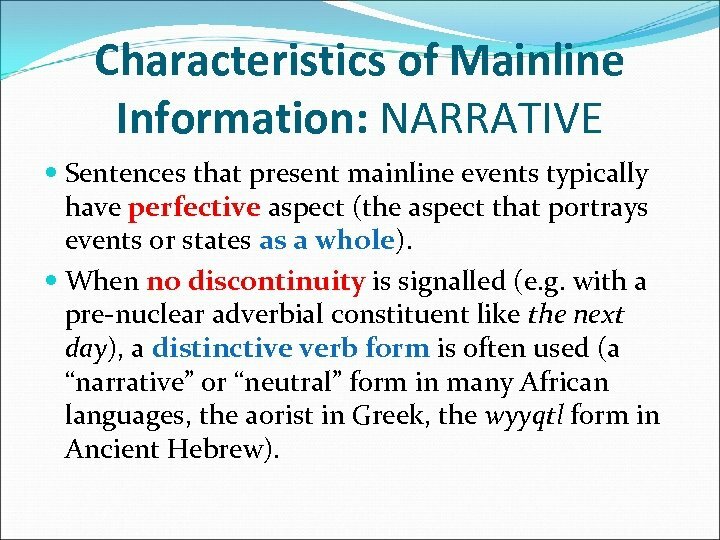 Characteristics of Mainline Information: NARRATIVE Sentences that present mainline events typically have perfective aspect (the aspect that portrays events or states as a whole). When no discontinuity is signalled (e. g. with a pre-nuclear adverbial constituent like the next day), a distinctive verb form is often used (a “narrative” or “neutral” form in many African languages, the aorist in Greek, the wyyqtl form in Ancient Hebrew). 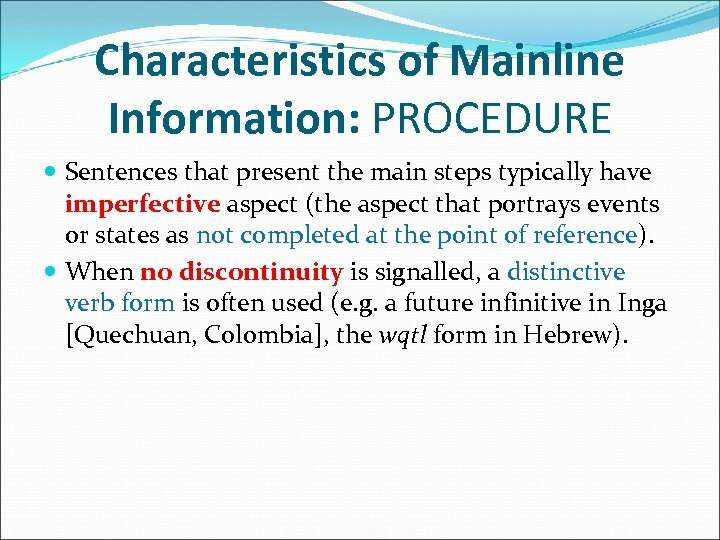 Characteristics of Mainline Information: PROCEDURE Sentences that present the main steps typically have imperfective aspect (the aspect that portrays events or states as not completed at the point of reference). When no discontinuity is signalled, a distinctive verb form is often used (e. g. a future infinitive in Inga [Quechuan, Colombia], the wqtl form in Hebrew). 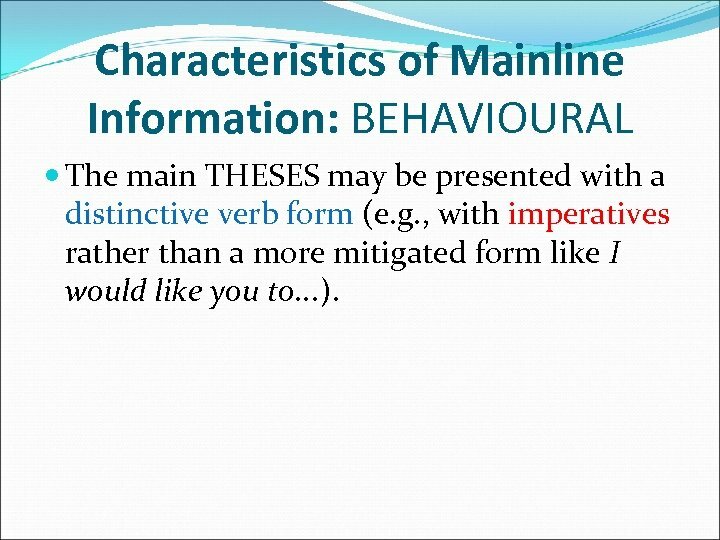 Characteristics of Mainline Information: BEHAVIOURAL The main THESES may be presented with a distinctive verb form (e. g. , with imperatives rather than a more mitigated form like I would like you to. . . ). 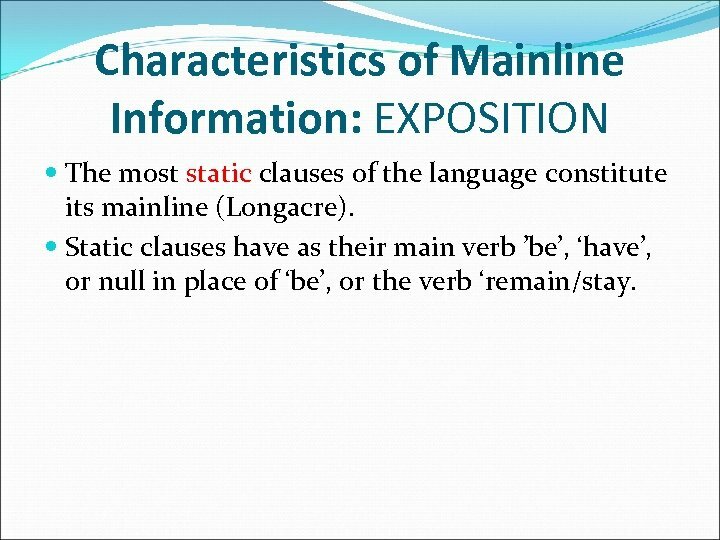 Characteristics of Mainline Information: EXPOSITION The most static clauses of the language constitute its mainline (Longacre). Static clauses have as their main verb ’be’, ‘have’, or null in place of ‘be’, or the verb ‘remain/stay. 2. 2. 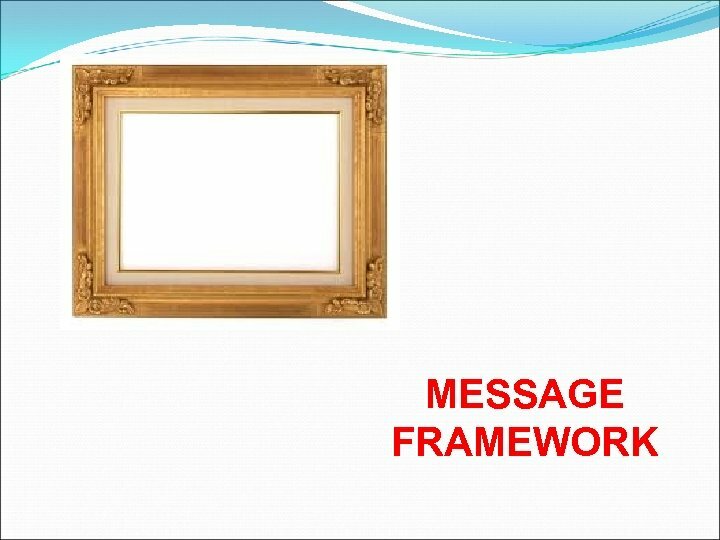 2 The Message Framework: … provides a framework for the message without being part of the message itself. 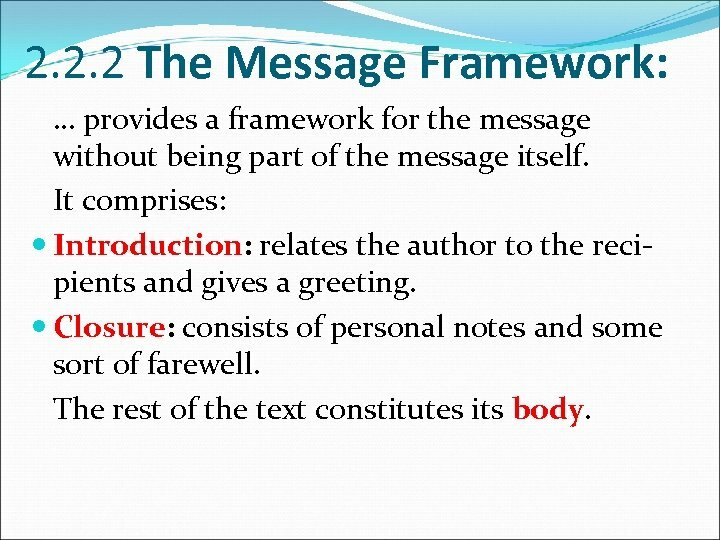 It comprises: Introduction: relates the author to the recipients and gives a greeting. Closure: consists of personal notes and some sort of farewell. The rest of the text constitutes its body. 2. 2. 3 Mainline and Supportive Information Within the main body, Breeze (1992) distinguishes between the mainline THESES and the supportive information. 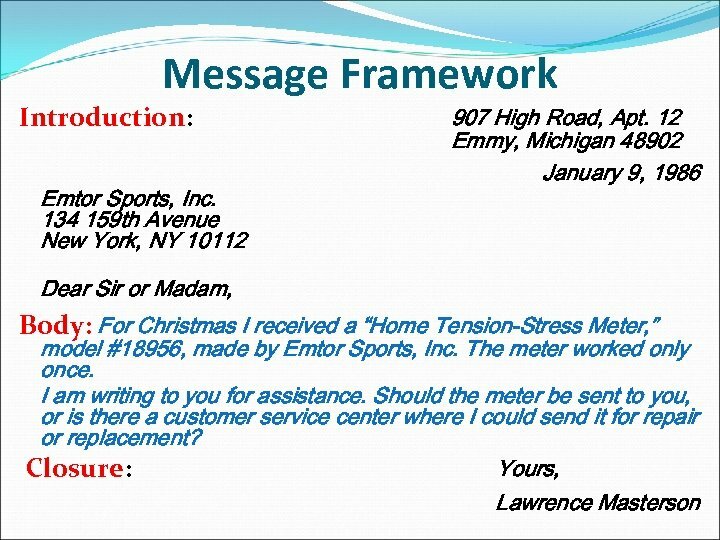 For Christmas I received a “Home Tension-Stress Meter, ” model #18956, made by Emtor Sports, Inc. The meter worked only once. I am writing to you for assistance. Should the meter be sent to you, or is there a customer service center where I could send it for repair or replacement? 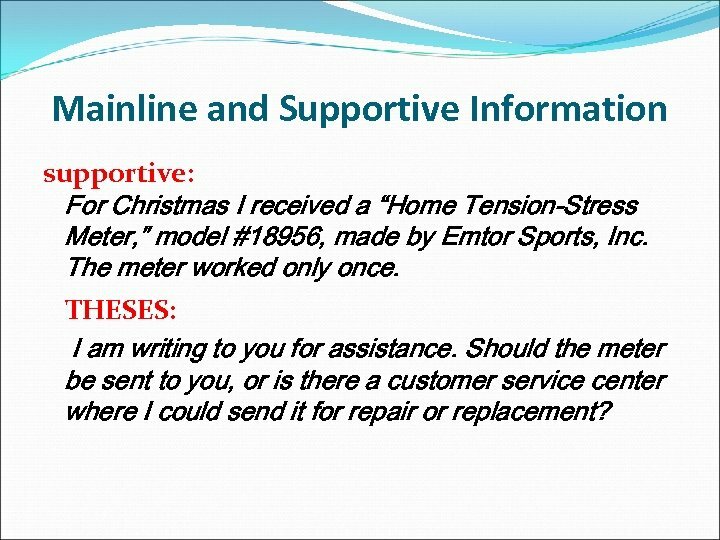 Mainline and Supportive Information supportive: For Christmas I received a “Home Tension-Stress Meter, ” model #18956, made by Emtor Sports, Inc. The meter worked only once. THESES: I am writing to you for assistance. 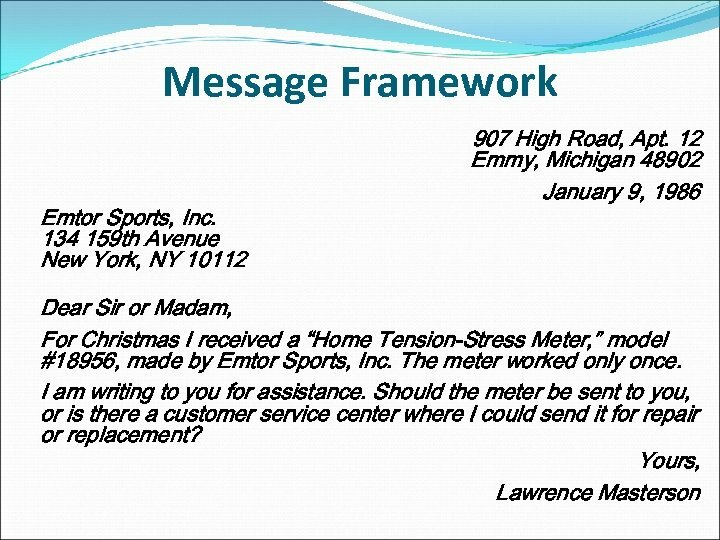 Should the meter be sent to you, or is there a customer service center where I could send it for repair or replacement? Mainline and Supportive Information: ‘The Old Baloch & the Camel’ (Balochi) 1. Dear camel, I have now come to my senses and now I know that I have been unjust to you. 2. I have loaded you up with heavy loads, taken you to far and distant destinations, and left you without any fodder. 3. This is why you have become thin and exhausted now, have fallen down and now are dying. 4. I want you, in your final breath, to pardon and forgive me; do not take my negligence into consideration. 5. I have done much injustice to you, hit you with sticks and whips, and loaded you up with huge loads without considering whether your body can carry these loads or not. Mainline and Supportive Information: ‘The Old Baloch & the Camel’ (Balochi) 1. Dear camel, I have now come to my senses and now I know that I have been unjust to you. 2. I have loaded you up with heavy loads, taken you to far and distant destinations, and left you without any fodder. 3. This is why you have become thin and exhausted now, have fallen down and now are dying. THESIS: 4. I want you, in your final breath, to pardon and forgive me; do not take my negligence into consideration. 5. I have done much injustice to you, hit you with sticks and whips, and loaded you up with huge loads without considering whether your body can carry these loads or not. 2. 2. 4 Supportive Exhortations Some exhortations are not mainline THESES. Rather, they support the THESES. Some supportive exhortations function as attention getters for following THESES. Others reinforce preceding mainline THESES. Supportive Exhortations: Kalinga (Philippines) 1. Children, this (is) what you need to do when you go to school in a far place. 2. The first thing (is) to think hard, so that what you enrol in is a course you know you like and one you can afford… 20. When you've finished, then, see that you get married, provided you find work… 22. It's good if you children who are studying listen to these teachings as you ought. Supportive Exhortations: Kalinga (Philippines) Attention getter: Children, this (is) what you need to do when you go to school in a far place. 2. The first thing (is) to think hard, so that what you enrol in is a course you know you like and one you can afford… 20. When you've finished, then, see that you get married, provided you find work… Reinforcement: It's good if you children who are studying listen to these teachings as you ought. 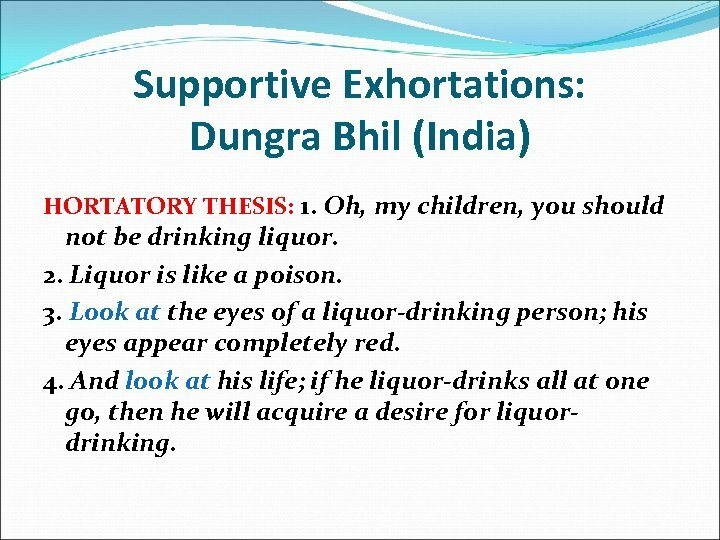 Supportive Exhortations: Dungra Bhil (India) HORTATORY THESIS: 1. Oh, my children, you should not be drinking liquor. 2. Liquor is like a poison. 3. Look at the eyes of a liquor-drinking person; his eyes appear completely red. 4. And look at his life; if he liquor-drinks all at one go, then he will acquire a desire for liquordrinking. 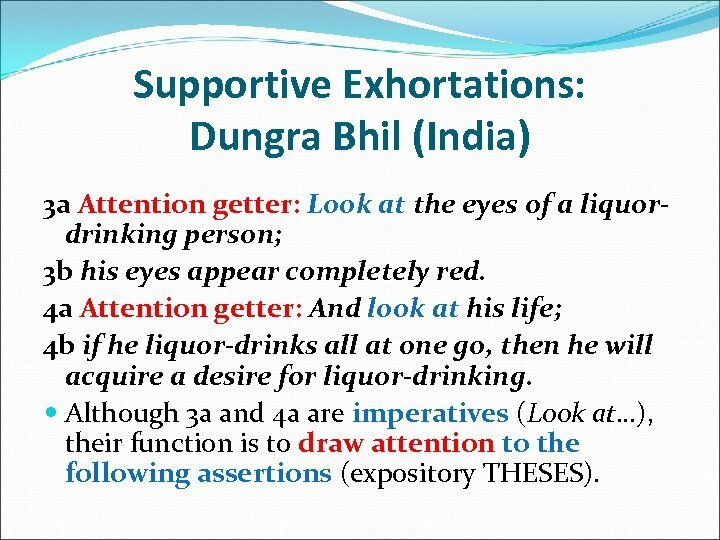 Supportive Exhortations: Dungra Bhil (India) 3 a Attention getter: Look at the eyes of a liquordrinking person; 3 b his eyes appear completely red. 4 a Attention getter: And look at his life; 4 b if he liquor-drinks all at one go, then he will acquire a desire for liquor-drinking. Although 3 a and 4 a are imperatives (Look at…), their function is to draw attention to the following assertions (expository THESES). 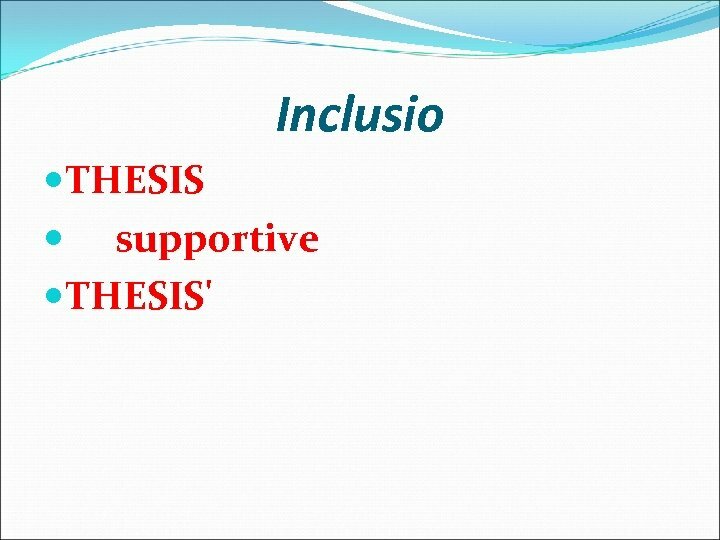 Supportive Exhortations: SUMMARY Exhortations that support mainline THESES typically occur at the beginning or at the end of the unit they support. Attention getters are typically at the beginning, preceding the unit they support. Reinforcing exhortations are typically at the end, following the unit they support. 2. 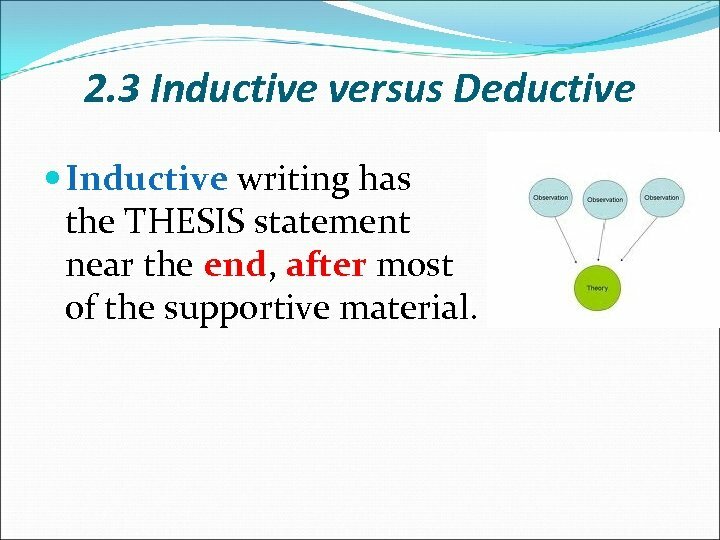 3 Inductive versus Deductive Inductive writing has the THESIS statement near the end, after most of the supportive material. 2. 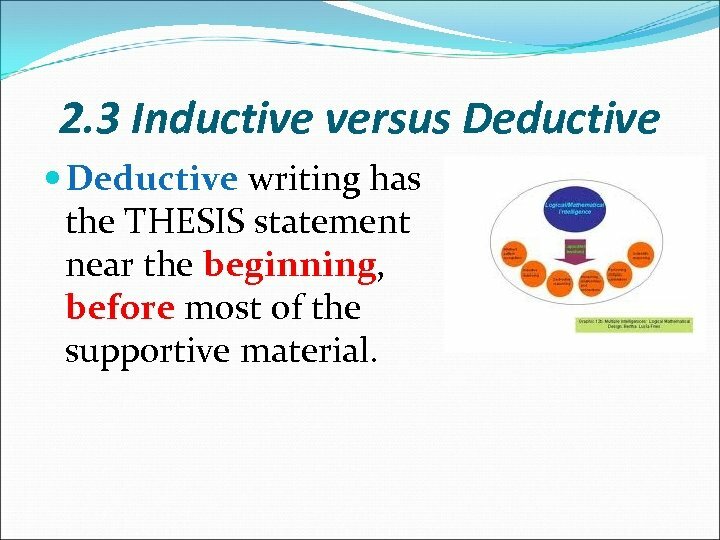 3 Inductive versus Deductive writing has the THESIS statement near the beginning, before most of the supportive material. 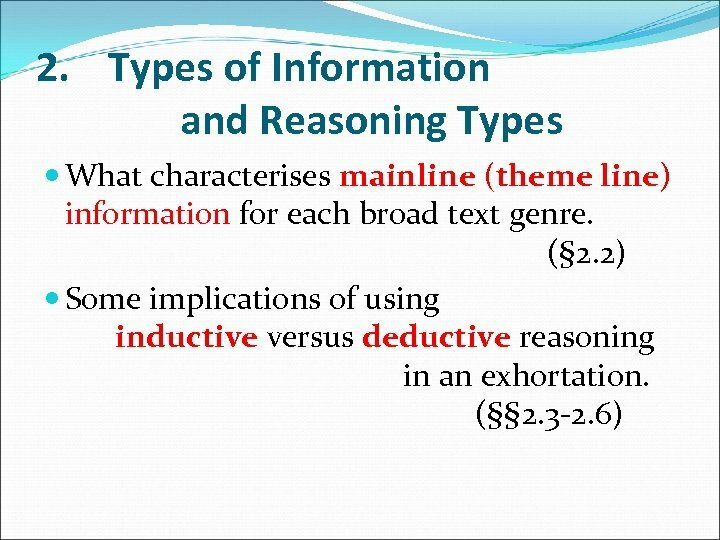 Inductive versus Deductive: Dungra Bhil 1 -34 supportive. . . And he was so hurt that he could not walk. How could we take those two sick people [to hospital]? If the road to our village were good, we would not suffer this much difficulty. 35 ff HORT. THESES So, Tahasil officer, please help us. Please build a good road for us poor people… This speech has inductive style; 1 -34 lead up to the THESES of 35 ff. 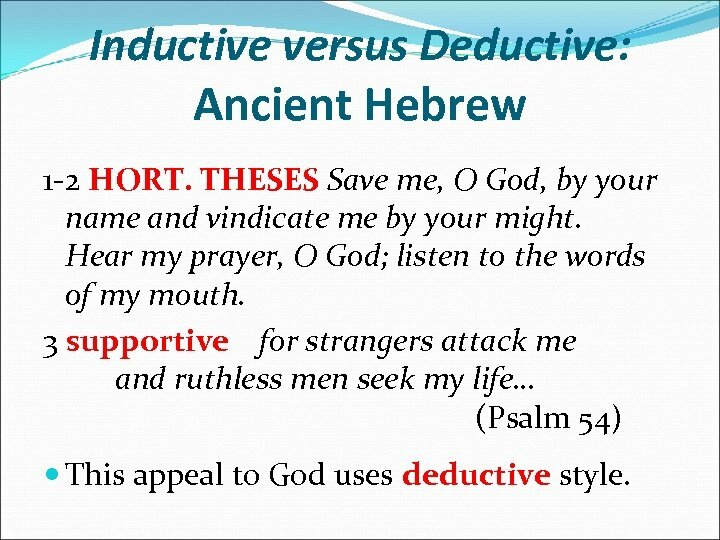 Inductive versus Deductive: Ancient Hebrew 5 a HORT. THESIS You shall not bow down to them or worship them; 5 b supportive for I, the LORD your God, am a jealous God. . . (Exodus 20) God’s commands typically use deductive style. 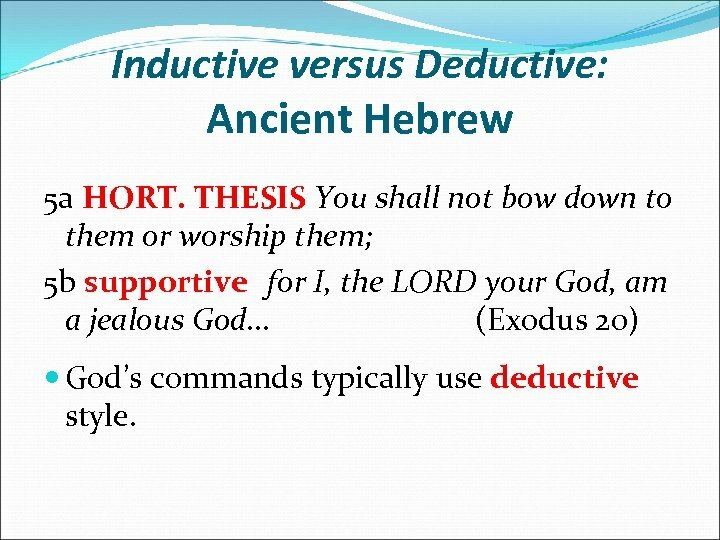 Inductive versus Deductive: Ancient Hebrew 1 -2 HORT. THESES Save me, O God, by your name and vindicate me by your might. Hear my prayer, O God; listen to the words of my mouth. 3 supportive for strangers attack me and ruthless men seek my life… (Psalm 54) This appeal to God uses deductive style. 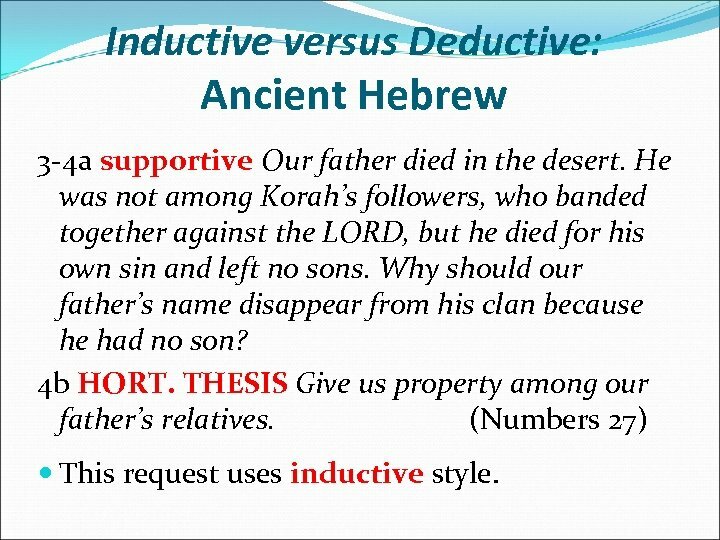 Inductive versus Deductive: Ancient Hebrew 3 -4 a supportive Our father died in the desert. He was not among Korah’s followers, who banded together against the LORD, but he died for his own sin and left no sons. Why should our father’s name disappear from his clan because he had no son? 4 b HORT. THESIS Give us property among our father’s relatives. (Numbers 27) This request uses inductive style. Inductive versus Deductive: Hebrew 7 -9 supportive I have indeed seen the misery of my people in Egypt. I have heard them crying out because of their slave drivers, and I am concerned about their suffering. I have come down to rescue them from the hand of the Egyptians and to bring them up out of that land into a good and spacious land. . . 10 HORT. THESIS And now, go. I am sending you to Pharaoh to bring my people the Israelites out of Egypt. (Exodus 3) This passage uses inductive style. 2. 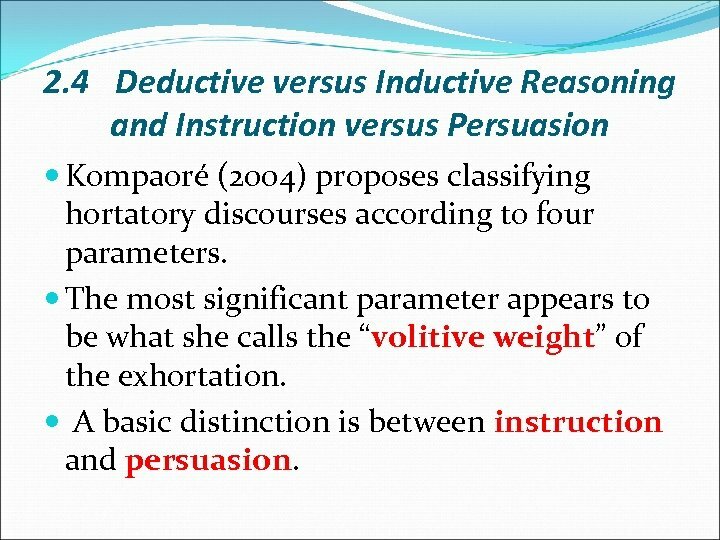 4 Deductive versus Inductive Reasoning and Instruction versus Persuasion Kompaoré (2004) proposes classifying hortatory discourses according to four parameters. The most significant parameter appears to be what she calls the “volitive weight” of the exhortation. 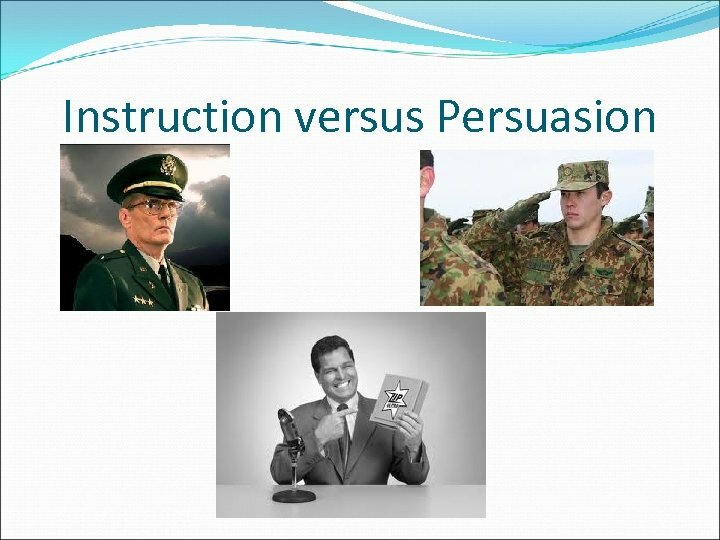 A basic distinction is between instruction and persuasion. 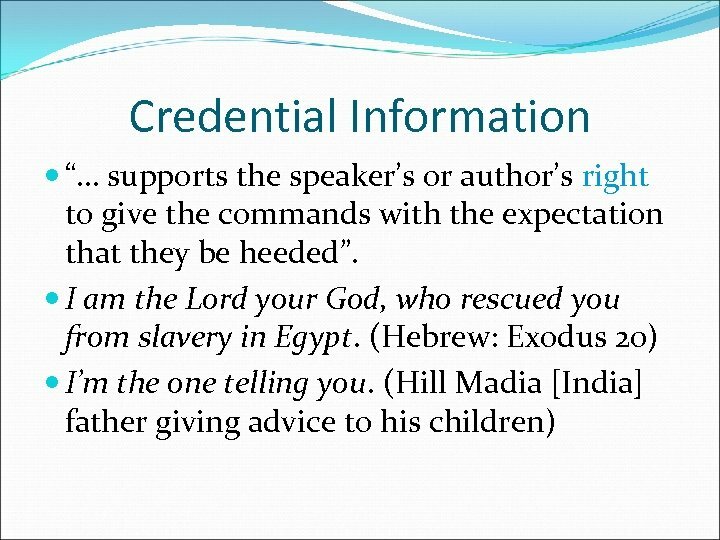 INSTRUCTION A speaker or writer (exhorter) considers him or herself to have the right or authority to tell the exhortee how to behave. 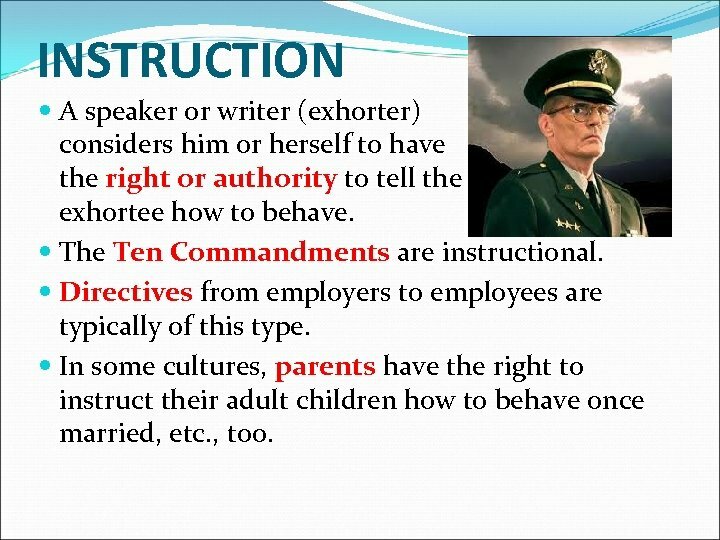 The Ten Commandments are instructional. Directives from employers to employees are typically of this type. In some cultures, parents have the right to instruct their adult children how to behave once married, etc. , too. 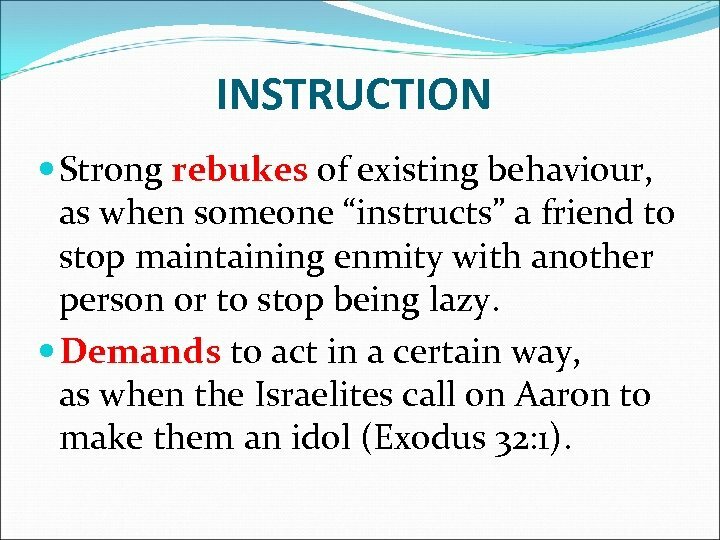 INSTRUCTION Strong rebukes of existing behaviour, as when someone “instructs” a friend to stop maintaining enmity with another person or to stop being lazy. Demands to act in a certain way, as when the Israelites call on Aaron to make them an idol (Exodus 32: 1). 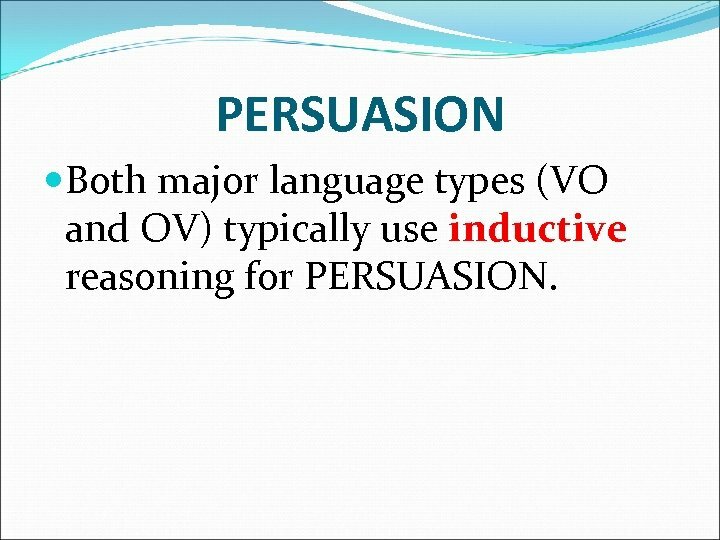 PERSUASION Both major language types (VO and OV) typically use inductive reasoning for PERSUASION. 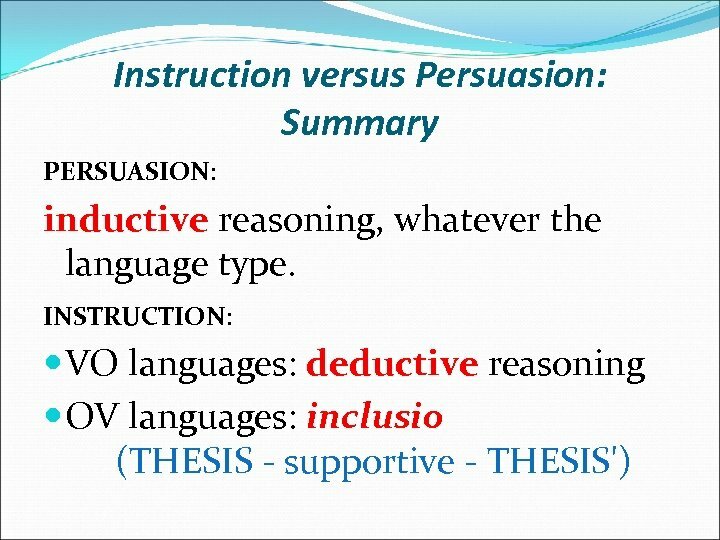 INSTRUCTION In VO languages, it is normal for an exhorter to use deductive reasoning for INSTRUCTIONS. 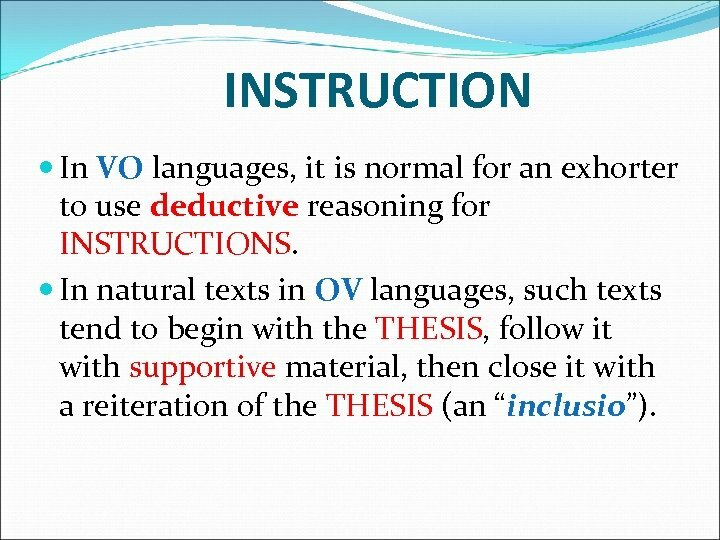 In natural texts in OV languages, such texts tend to begin with the THESIS, follow it with supportive material, then close it with a reiteration of the THESIS (an “inclusio”). Inclusio Menya (OV, Papua New Guinea) 1 -2 topic introducer Concerning me giving my oldest son instruction. I give him instruction such as this. 3 HORT. THESIS My bringing you to school, it's for this: to go to gain knowledge, you are not to be lazy and are always to go. 4 supportive The reason is this: I your father will no longer be alive [one day] and because of that I send you. 5 supportive: consequence Then you also will become big and live later and [then] no longer be alive. 6 HORT. THESIS' That being the case, you should always be one who goes without being lazy, listens to whatever the teacher teaches you (plural), learns and follows it. 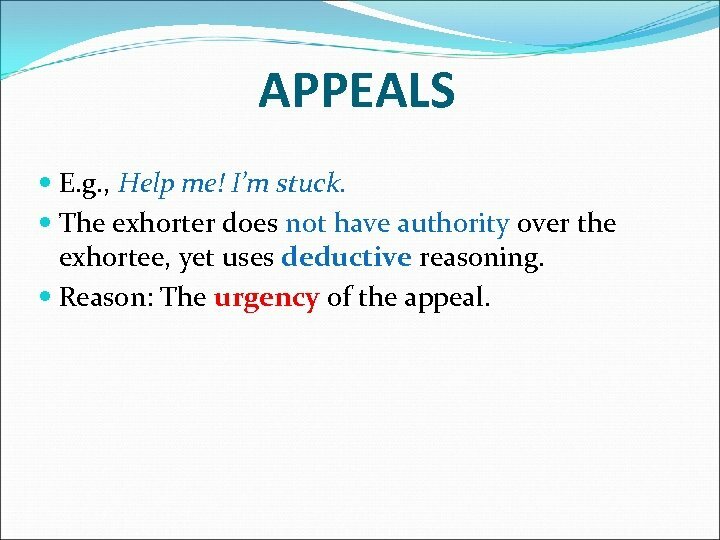 APPEALS E. g. , Help me! I’m stuck. 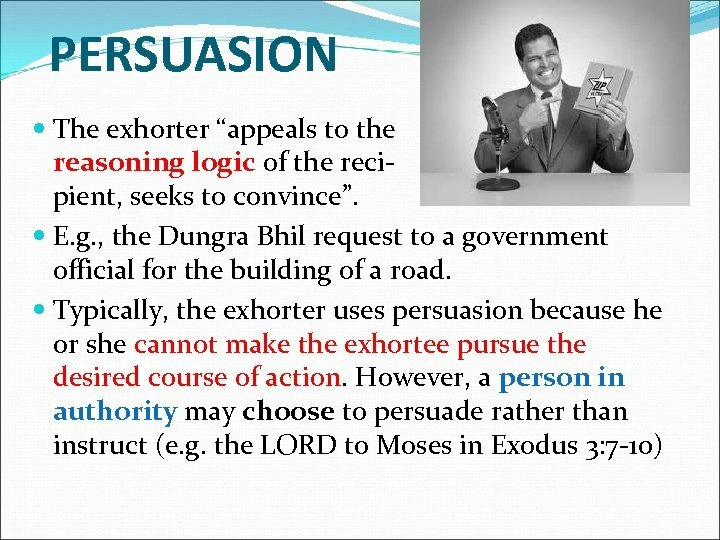 The exhorter does not have authority over the exhortee, yet uses deductive reasoning. Reason: The urgency of the appeal. Instruction versus Persuasion: Rana Tharu (OV, India) The speaker first instructed her younger daughter-in-law (not a Tharu) how to behave to visiting male relatives. She used a series of inclusios in this speech. She then turned to her older daughter-inlaw, who was a Tharu, and used inductive reasoning to persuade her to set a good example to the younger wife. 2. 5 Types of Supportive Information Breeze (1992) distinguishes four types of supportive information: Situational Motivational Credential Enabling. 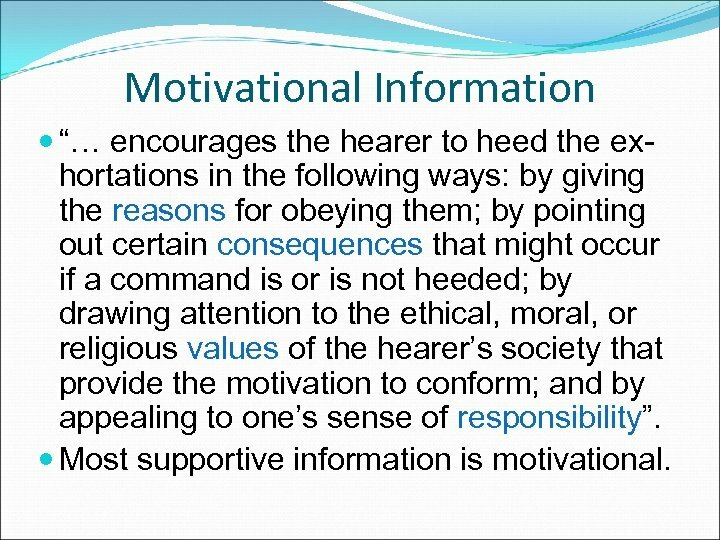 Motivational Information “… encourages the hearer to heed the exhortations in the following ways: by giving the reasons for obeying them; by pointing out certain consequences that might occur if a command is or is not heeded; by drawing attention to the ethical, moral, or religious values of the hearer’s society that provide the motivation to conform; and by appealing to one’s sense of responsibility”. Most supportive information is motivational. 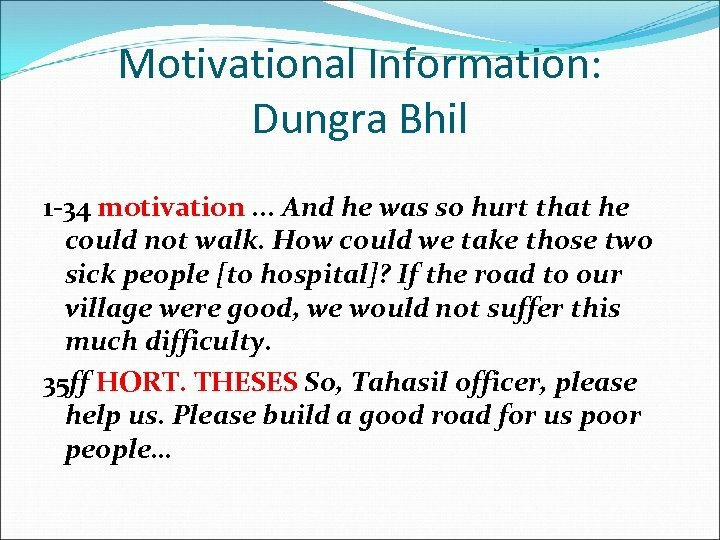 Motivational Information HORT. THESIS Help me! Motivation I’m stuck. Enabling Information “…informs or reminds readers of what has already been done to help them keep the commands”. For this reason I bow my knees before the Father, from whom every family in heaven and on earth is named, that according to the riches of his glory he may grant you to be strengthened with might through his Spirit in the inner man… (Koine Greek: Ephesians 3). 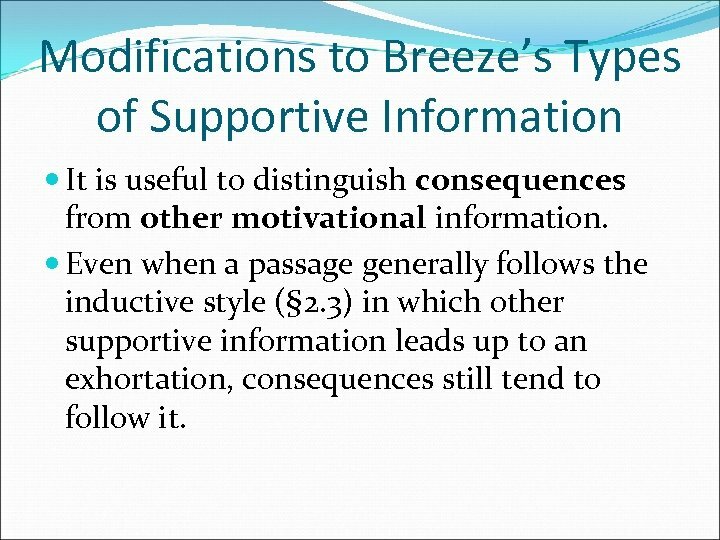 Modifications to Breeze’s Types of Supportive Information It is useful to distinguish consequences from other motivational information. Even when a passage generally follows the inductive style (§ 2. 3) in which other supportive information leads up to an exhortation, consequences still tend to follow it. 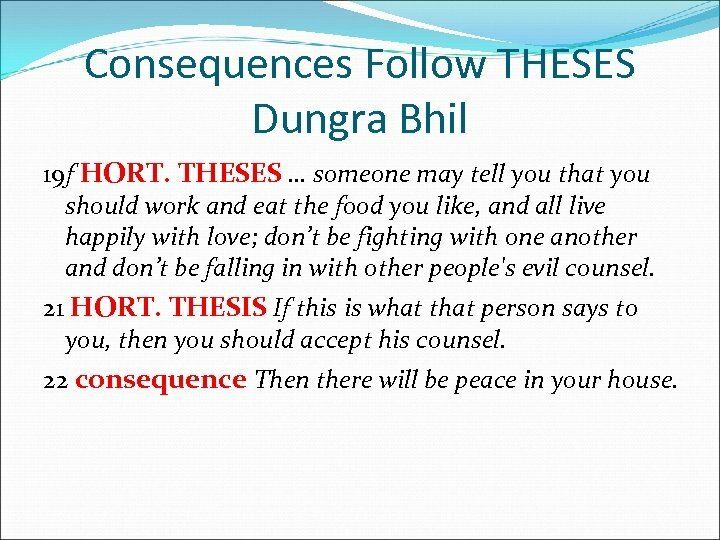 Consequences Follow THESES Dungra Bhil 19 f HORT. THESES … someone may tell you that you should work and eat the food you like, and all live happily with love; don’t be fighting with one another and don’t be falling in with other people's evil counsel. 21 HORT. THESIS If this is what that person says to you, then you should accept his counsel. 22 consequence Then there will be peace in your house. 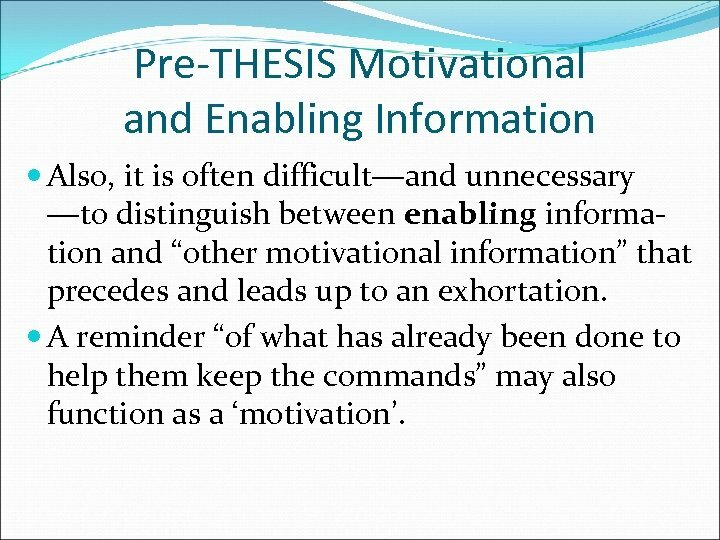 Pre-THESIS Motivational and Enabling Information Also, it is often difficult―and unnecessary ―to distinguish between enabling information and “other motivational information” that precedes and leads up to an exhortation. 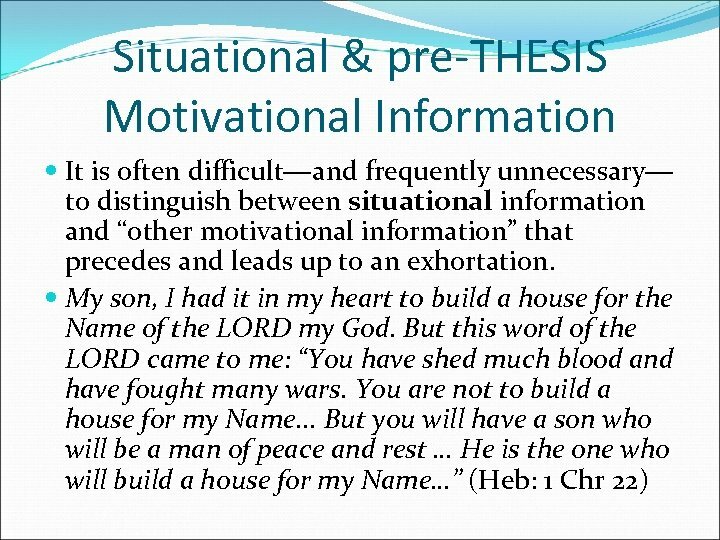 A reminder “of what has already been done to help them keep the commands” may also function as a ‘motivation’. 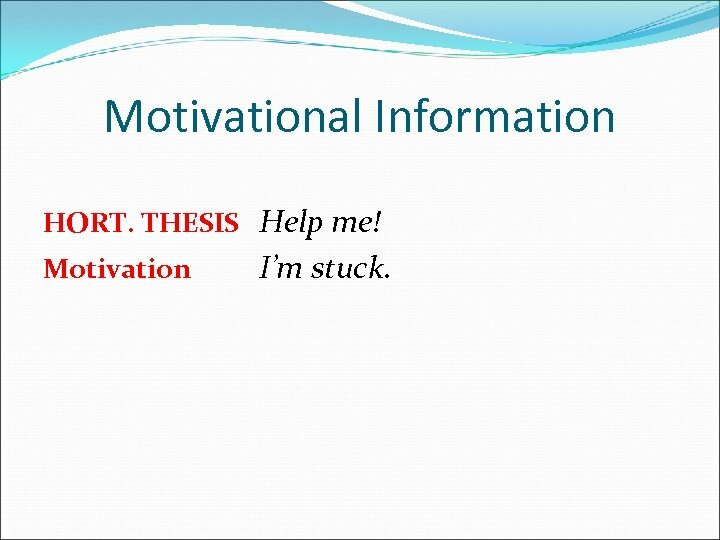 Revised Classification of Supportive Information situational + pre-THESIS motivational credential consequences a catch-all category for enabling and other motivational material. One more distinction! 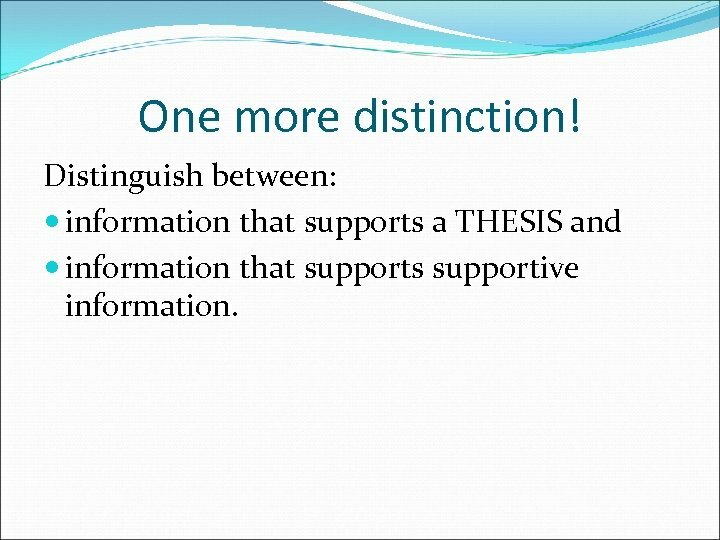 Distinguish between: information that supports a THESIS and information that supports supportive information. 2. 5 Summary Classify supportive information as: situational + pre-THESIS motivational credential consequences enabling + other motivational. 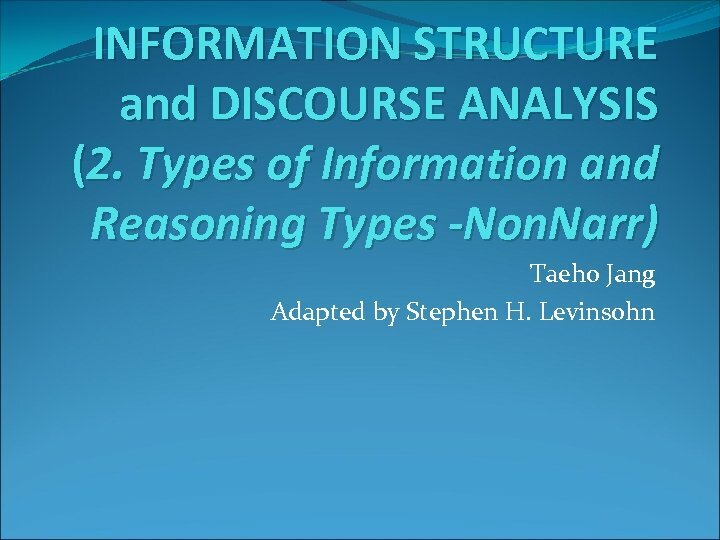 Distinguish information that supports a THESIS from information that supports supportive information. Types of Supportive Information: ‘The Old Baloch & the Camel’ (Balochi) 1. Dear camel, I have now come to my senses and now I know that I have been unjust to you. 2. I have loaded you up with heavy loads, taken you to far and distant destinations, and left you without any fodder. 3. This is why you have become thin and exhausted now, have fallen down and now are dying. 4. I want you, in your final breath, to pardon and forgive me; do not take my negligence into consideration. 5. I have done much injustice to you, hit you with sticks and whips, and loaded you up with huge loads without considering whether your body can carry these loads or not. 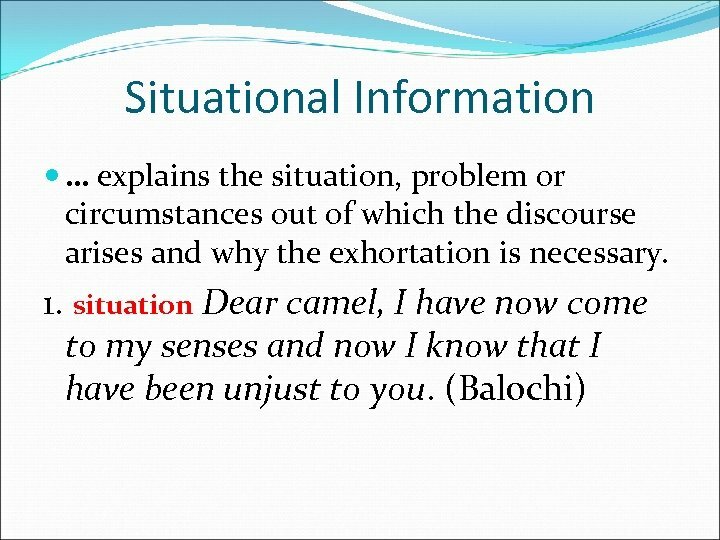 Types of Supportive Info: Balochi 1 -3. situation/ motivation for #4 Dear camel, I have now come to my senses and now I know that I have been unjust to you. I have loaded you up with heavy loads, taken you to far and distant destinations, and left you without any fodder. This is why you have become thin and exhausted now, have fallen down and now are dying. 4. HORT. THESES I want you, in your final breath, to pardon and forgive me; do not take my negligence into consideration. 5. motivation for #4 I have done much injustice to you, hit you with sticks and whips, and loaded you up with huge loads without considering whether you body can carry these loads or not. Distribution of types of supportive information in VO & OV languages When translating from a VO to an OV language: Problems in the order in which the information is presented are most likely to arise in instructional texts when “other motivational” material such as explanations for exhortations and reasons for obeying them occur. 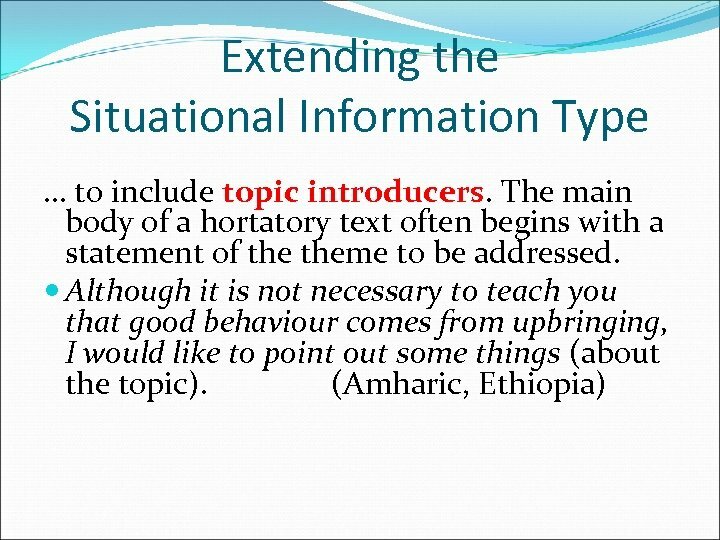 Problems arise also with explanations for expository THESES and reasons for accepting their validity. Distribution of types of supportive information in VO & OV languages Explanatory information and reasons typically follow THESES in VO languages. Such an ordering can be problematic in OV languages. OV Strategies for Handling Explanations & Reasons See Non-Narrative § 2. 6 (pp. 23 -25). 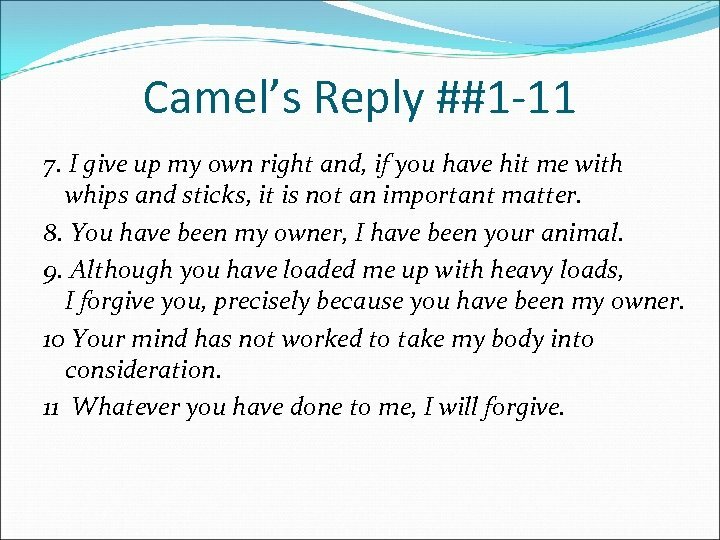 Camel’s Reply ##1 -11 1. It is no matter. 2. 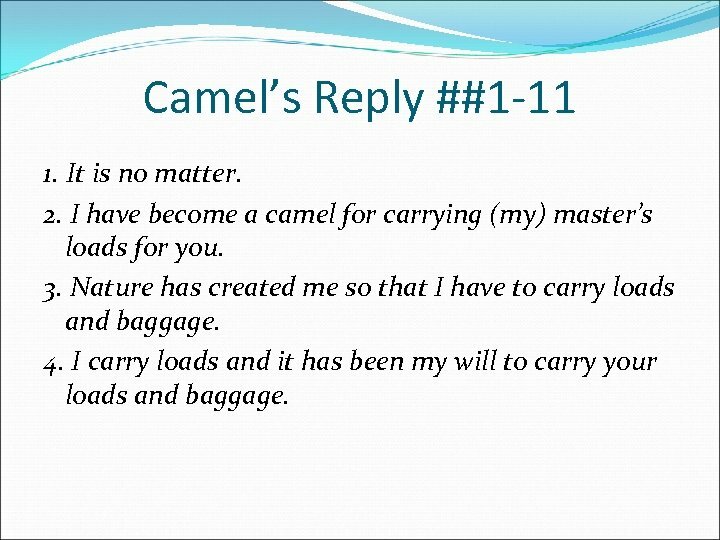 I have become a camel for carrying (my) master’s loads for you. 3. Nature has created me so that I have to carry loads and baggage. 4. I carry loads and it has been my will to carry your loads and baggage. 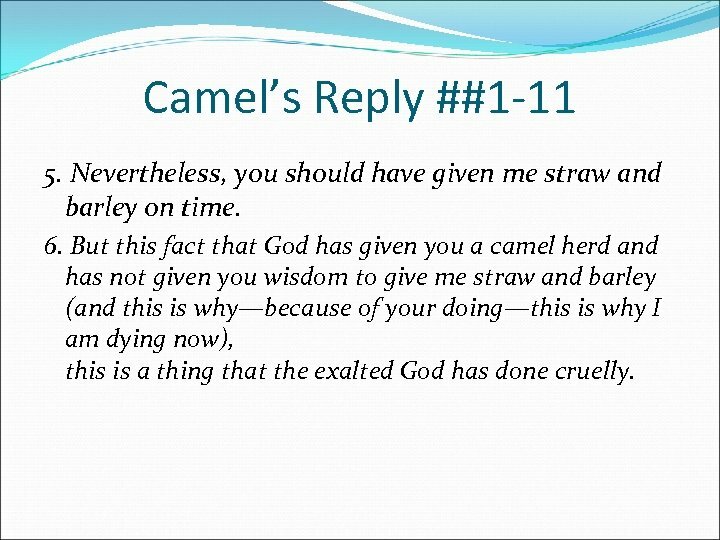 Camel’s Reply ##1 -11 5. Nevertheless, you should have given me straw and barley on time. 6. But this fact that God has given you a camel herd and has not given you wisdom to give me straw and barley (and this is why—because of your doing—this is why I am dying now), this is a thing that the exalted God has done cruelly. Camel’s Reply ##1 -11 7. I give up my own right and, if you have hit me with whips and sticks, it is not an important matter. 8. You have been my owner, I have been your animal. 9. Although you have loaded me up with heavy loads, I forgive you, precisely because you have been my owner. 10 Your mind has not worked to take my body into consideration. 11 Whatever you have done to me, I will forgive. 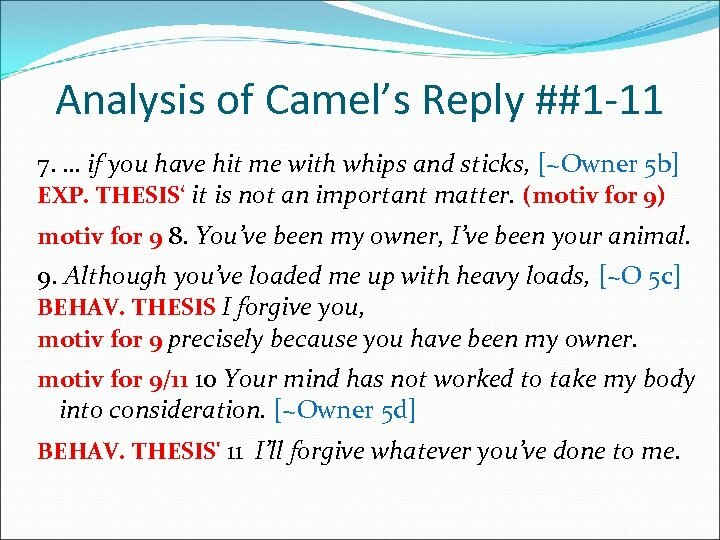 Analysis of Camel’s Reply ##1 -11 EXP. THESIS 1. It is no matter. motivation for 1/7 c 2 -4. I have become a camel for carrying (my) master’s loads for you. Nature has created me so that I have to carry loads and baggage. I carry loads and it has been my will to carry your loads and baggage… motivation for 7 c 7(a) I give up my own right (b) and, if you have hit me with whips and sticks, EXP. THESIS' (c) it is not an important matter. 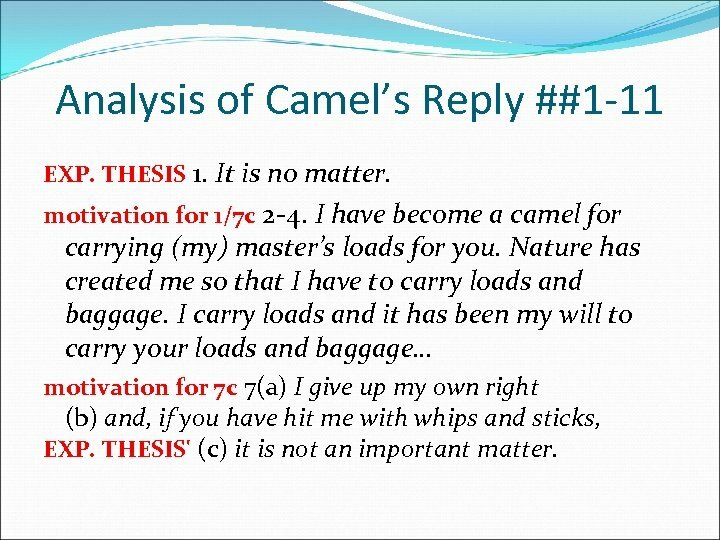 Analysis of Camel’s Reply ##1 -11 7. … if you have hit me with whips and sticks, [~Owner 5 b] EXP. THESIS‘ it is not an important matter. (motiv for 9) motiv for 9 8. You’ve been my owner, I’ve been your animal. 9. Although you’ve loaded me up with heavy loads, [~O 5 c] BEHAV. THESIS I forgive you, motiv for 9 precisely because you have been my owner. motiv for 9/11 10 Your mind has not worked to take my body into consideration. [~Owner 5 d] BEHAV. THESIS' 11 I’ll forgive whatever you’ve done to me. 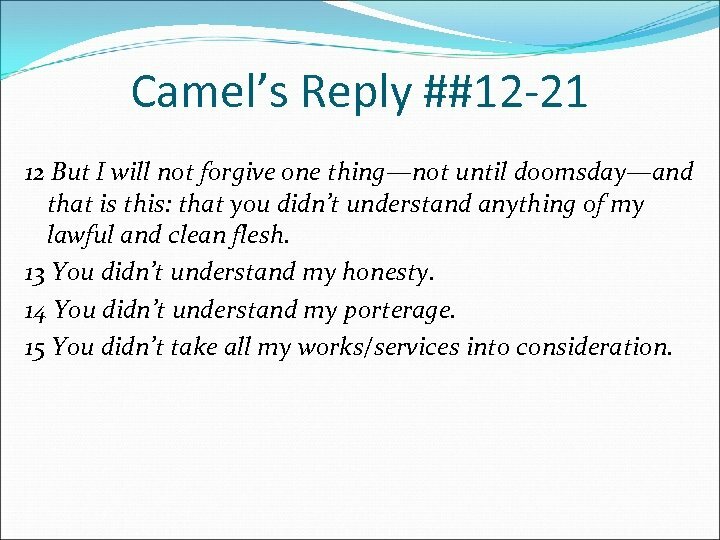 Camel’s Reply ##12 -21 12 But I will not forgive one thing—not until doomsday—and that is this: that you didn’t understand anything of my lawful and clean flesh. 13 You didn’t understand my honesty. 14 You didn’t understand my porterage. 15 You didn’t take all my works/services into consideration. 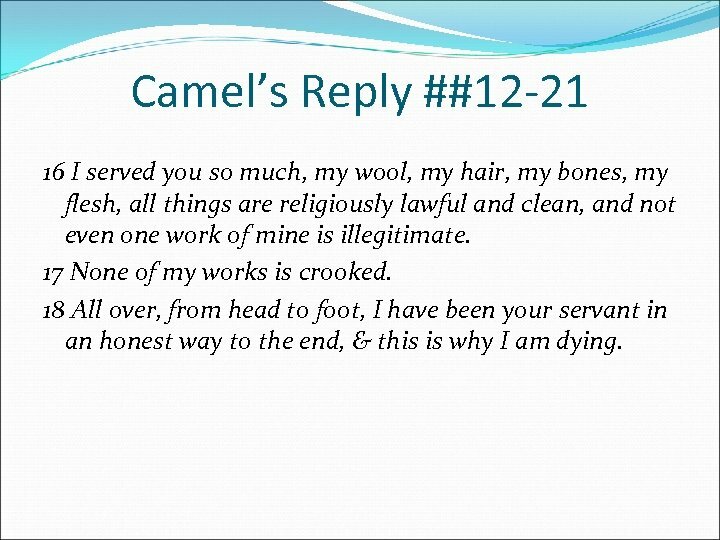 Camel’s Reply ##12 -21 16 I served you so much, my wool, my hair, my bones, my flesh, all things are religiously lawful and clean, and not even one work of mine is illegitimate. 17 None of my works is crooked. 18 All over, from head to foot, I have been your servant in an honest way to the end, & this is why I am dying. 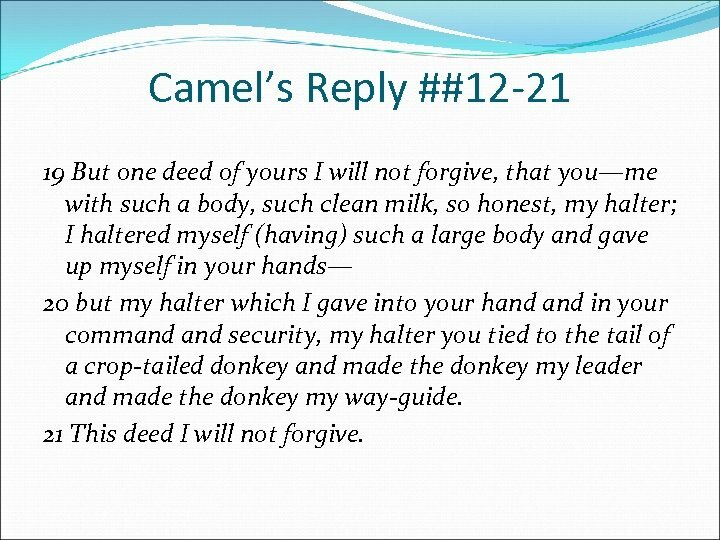 Camel’s Reply ##12 -21 19 But one deed of yours I will not forgive, that you—me with such a body, such clean milk, so honest, my halter; I haltered myself (having) such a large body and gave up myself in your hands— 20 but my halter which I gave into your hand in your command security, my halter you tied to the tail of a crop-tailed donkey and made the donkey my leader and made the donkey my way-guide. 21 This deed I will not forgive.